For more than a decade, the Everybody Plays committee has been working with the City of Pittsburg Parks & Recreation Department to create an inclusive community play space for children and families of all abilities to enjoy. Thanks to a generous $150,000 donation from an anonymous donor, the group’s vision is taking a big step forward. 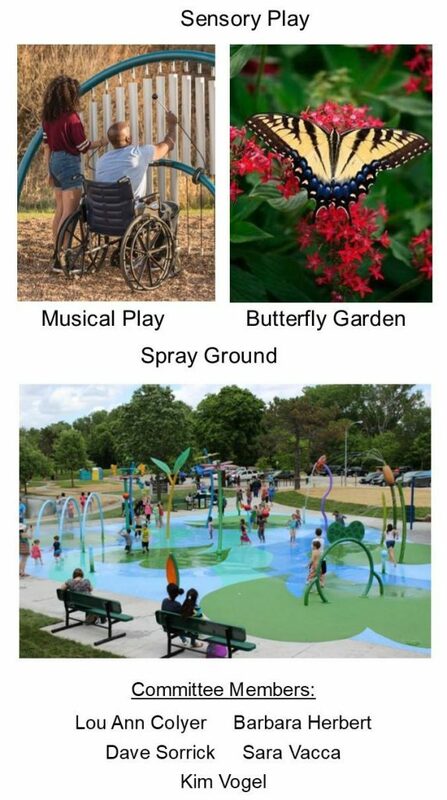 The funds will go toward building a shelter house and adding new sensory play features to Schlanger Park, including a butterfly garden and a musical play space. The Everybody Plays mission is to create a multi-generational and universally-accessible playground for community members of all ages and abilities. “Play is a fundamental part of life, and everyone should have an opportunity to play,” said committee member Lou Ann Colyer. The small task force has spearheaded other successful projects at Schlanger Park over the years, from the installation of adjustable basketball goals and accessible swings, to the opening of Katherine’s Playground, a universally-accessible play space. Colyer stated that the group has seen slow, steady progress over the years, and she is excited to see their vision gaining more momentum. City of Pittsburg Director of Parks & Recreation, Kim Vogel, says community partnerships are crucial to moving their vision forward. In addition to the $150,000 gift, the group has also received $10,000 from Pittsburg Beautiful for the shelter house, $2,000 from a local family toward the butterfly garden, a donation from the Cow Creek Bluegrass Festival for the musical play area, and more. Recreation programs through the City’s Parks and Recreation Department also help raise funds for the project. Events like Just Another Mudder, Give Thanks 5K, and others have generated more than $6,000 toward Schlanger Park improvements. Everybody Plays committee member Dave Sorrick says the enhancements to Schlanger Park will complement the community development plans already in the works. In addition to the shelter house, butterfly garden, and musical play space, the group’s master plan includes a new Schlanger Center and a splash zone with water features. Sorrick says additional funding is still needed to complete the project and the committee is inviting more community partners to participate. “The $150,000 donation helped jump-start the project, but we have more work to be done and more opportunities to give,” said Sorrick. To help generate funds, the group has launched a new fundraiser, selling customizable brick pavers for the park. Individuals, businesses and organizations wishing to participate, can buy pavers with their name or logo added, or dedicate them in honor of a loved one. 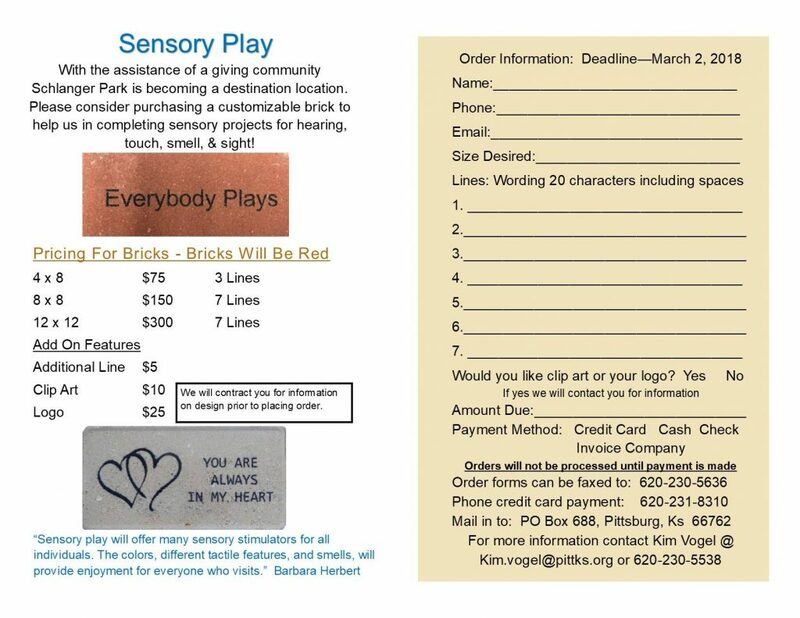 To purchase brick pavers or donate to the Everybody Plays project, contact the City of Pittsburg Parks & Recreation Department at (620) 231-8310.